1. 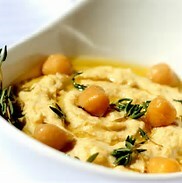 Place chickpeas, sesame seeds, olive oil, lemon juice, garlic, and cumin into a blender and blend until smooth and creamy. Store in an airtight container for up to 10 days in the fridge.